President Obama has honored Dr. Mark Salman Humayun of Pakistani origin with the National Medal of Technology and Innovation at a White House ceremony recently, according to a USC Eye Institute press release. Dr. Humayun's "bionic eye" offers a solution for those who have the inherited retinal degenerative disease retinitis pigmentosa (RP). Known as the Argus II, it uses a camera mounted on special glasses that sends a signal to an electronic receiver with electrodes that are implanted in and around the eye. The electrodes send signals to the retina that stimulate the retina and then these retinal impulses travel through the optic nerve to the brain where they are interpreted as images. Dr. Humayun's "bionic eye" received approval from the FDA in the U.S. in 2013 and since then the USC Eye Institute has been one of the centers of excellence for patients receiving this implant. Dr. Humayun has trained ophthalmologic surgeons worldwide in implanting the Argus device that has been in use in Europe since 2011 and was also recently approved for implantation in Australia, according to USC Keck Institute. Born in Pakistan, Dr. Mark Salman Humayun is grandson of Quaid-e-Azam Mohammad Ali Jinnah's personal physician Dr. Ilahi Bakhsh, according to a story by Anjum Niaz of Pakistan's Dawn newspaper. 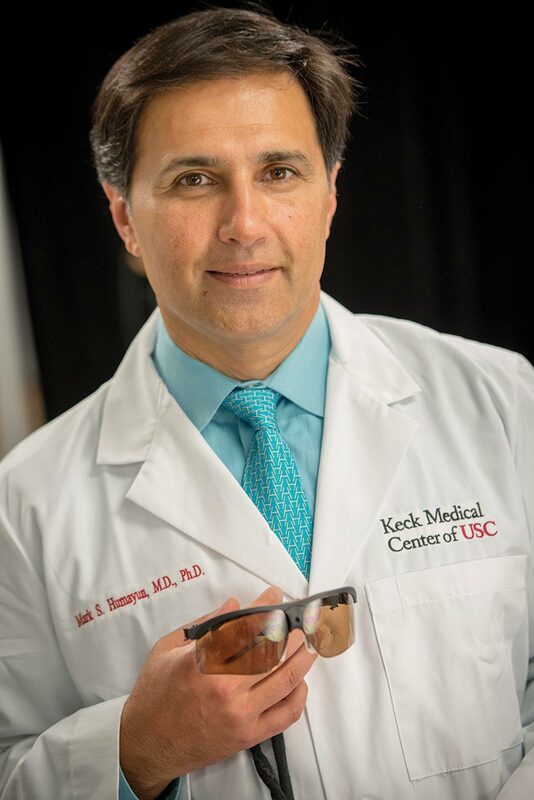 Dr. Humayun now leads the USC Eye Institute at the University of Southern California in Los Angeles where he is Professor of Ophthalmology and Biomedical Engineering. The Humayun family came to America in 1972. Dr. Humayun received his MD degree from Duke University, a PhD in Biomedical Engineering from University of North Carolina followed by clinical training in ophthalmology at Duke Medical Center as well as the Johns Hopkins Hospital. 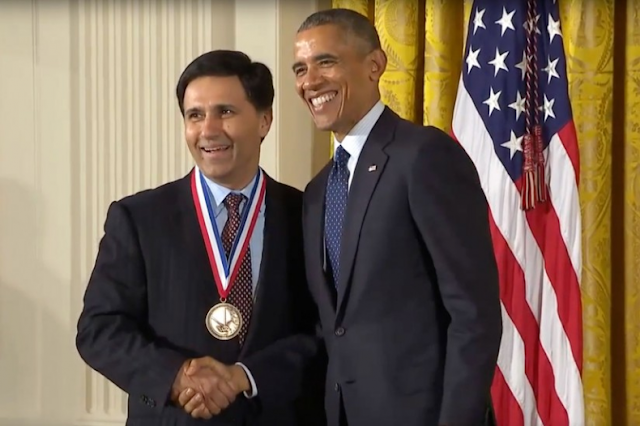 The news of Dr. Humayun's achievement comes on the heels of another Pakistani-American Dr. Nergis Mavalwala's contribution to discovery of gravitational waves that has been widely recognized. Mavalvala and her colleagues are credited with developing an ultrasensitive telescope designed to catch glimpses of gravitational waves. Albert Einstein predicted the existence of these ripples in spacetime nearly a century ago, but they haven’t been observed directly yet, according to the Science Magazine. Theoretically a consequence of violent cosmic events—the collisions of black holes, the explosive deaths of stars, or even the big bang—gravitational waves could provide a brand new lens for studying the universe, according to the magazine. So, a grandson of Pakistan's founder gets professionally recognized in the US now ! Rizwan: "So, a grandson of Pakistan's founder gets professionally recognized in the US now !" No, Humayun is not the grandson of Pakistan's founder; he's grandson of the founder's physician. Also In The Donald Trump Post I Had Asked About Whether One Of The Powerful SuperPAC Financers of Jeb Bush Muneer Sattar Is A Pakistani? Shah: "You A Week Ago Why Are You Not Writing About Dr Nargis Mawalwala.... "
I am not a full-time blogger. I write what I can when I can, time-permitting. Glad to see something positive. But he has nothing to do with Pakistan per se, as his entire education was here in the US. Knew some Indian would find some thing to criticize, so thanks Sundar for living up to the expectation. V. S. Nepaul was born/raised/educated/wrote outside India, but is considered an Indian because he won a Nobel. Actually if a Nobel Laurete just flies over India, he is considered an Indian, but when it comes to Pakistan you guys can't handle any good news. There is a reason why foreigners ruled you for 1000 years. I have no idea who V. S. Nepaul is, and I don't care much about India either. you should get educate yourself before posting comments. Zamir: "V. S. Nepaul was born/raised/educated/wrote outside India, but is considered an Indian because he won a Nobel. Actually if a Nobel Laurete just flies over India, he is considered an Indian, but when it comes to Pakistan you guys can't handle any good news. " "The dot on an Indian woman's forehead signifies an empty head"
Being an equal opportunity offender, Naipaul has also offended a lot of Muslims by his books about Islam and Muslims. This thread is about Dr.Humayun, not about Naipaul. This blog is about positive achievements of Pakistan and Pakistanis. But a certain group, with massive inferiority complex, thinks that anything positive about Pakistan is automatically a negation of their country and its failed ideals. Constant criticism is the hallmark of this group. You unfortunately did the same. Thanks for the comments. Good to see that Naipaul is capable of seeing the truth, lately Salman Rushdi has also joined the group, was a darling of Indian's when he was talking against Islam/Muslims/Pakistan. Now he has started doing the same to Indians. All I said is, if his Alma mater was from Pakistan, it adds more pride, than the mere fact that he was born in Pakistan. Somehow most Pakistani's think all Indian's would try to demean them, but this is just a myth. I frankly don't differentiate Pakistanis & Indians at a personal level. Yes inferiority complex. Just wondering, had he been an Indian would you have passed the same comment about his education? "Somehow most Pakistani's think all Indian's would try to demean them, but this is just a myth." Not sure about your background, but this is not a myth. Just check the history of this blog (not to mentioned hundreds of others) and you will find the truth. Most Indians are of the opinion that if anything good happens in Pakistan, it automatically means India's failure, validation of TNT, etc. etc. This is as if we have a zero sum game. The success of one is the failure of other. This is more prevelent among Indians. In reality both countries are barely above Sub-Saharan Africa on HDI index. >>Yes inferiority complex. Just wondering, had he been an Indian would you have passed the same comment about his education? Absolutely. Nationality has nothing to do with this. Mark S. Humayun is for all practical purposes just an American. "Absolutely. Nationality has nothing to do with this. Mark S. Humayun is for all practical purposes just an American." No he is not, under the Natural-born-citizen clause he cannot stand in election to the office of President or Vice President of the United States. A privileged afforded to natural born Americans. He was born in Pakistan to Pakistani parents, simple as that. Correction: Pakistan is in the LOW HDI category with most sub Saharan African countries. Nepal is ahead by 10 basis points and Bangladesh, Bhutan and India are in the MEDIUM HDI category from 3 to 15 notches above Pakistan. Correction: When it comes to a verbal or written showdown both countries are equally at fault. The problem Pakistan faces internationally; however, is its image of a land of many terrorists and that of a duplicitous terrorist haven. That image will not improve even if you highlight the many negatives of India. Iqbal: "The problem Pakistan faces internationally; however, is its image of a land of many terrorists and that of a duplicitous terrorist haven. That image will not improve even if you highlight the many negatives of India. " It's part of the powerful western media myth making machine that can demonize or lionize peoples and nations depending on what they see as being in the best western interest. "I.. saw much in this recent visit (to Pakistan) that did not conform to the main Western narrative for South Asia -- one in which India is steadily rising and Pakistan rapidly collapsing. Born of certain geopolitical needs and exigencies, this vision was always most useful to those who have built up India as an investment destination and a strategic counterweight to China....Seen through the narrow lens of the West’s security and economic interests, the great internal contradictions and tumult within these two large nation-states disappear. In the Western view, the credit-fueled consumerism among the Indian middle class appears a much bigger phenomenon than the extraordinary Maoist uprising in Central India". Pankaj Mishra is entitled to his views and that is completely acceptable. That versus, for example, former Pakistani Ambassador to the US, Hussain Haqqani or the exiled Tarek Fatah or the many other Pakistanis who are easily dismissed as "traitors". From giving birth to the Taliban or giving safe haven to Bin Laden and add to that the recent terrorist Tashfeen Malik - all of that gives Pakistan a bad image. Pakistan may not be "collapsing" but there is so much covertly or hidden about Pakistan that the international community worries about today. mahesh: "That versus, for example, former Pakistani Ambassador to the US, Hussain Haqqani or the exiled Tarek Fatah or the many other Pakistanis who are easily dismissed as "traitors"." How does this compare with lots of Indian citizens being branded "anti-national" every day and being told to go to Pakistan by India's top politicians and Modi government ministers? Has Pankaj Mishra ever called for the disintegration of his country of birth as Tarek Fatah has of Pakistan? Has Pankaj Mishra ever written Op Eds in western press calling for not supplying weapons to his country as Husain Haqqani did in a Wall Street Journal Op Ed tiled " Why Are We Sending This Attack Helicopter to Pakistan?" Pankaj Mishra vs Husain Haqanni Farid Zakaria Tom Friedman is a hopeless case. Ypu can quote him, while we are happy with the latter. It is a great treatment by Dr. Humayun for the entire humanity. I am perplexed by some of the comments though. What difference does it make if anyone considers it a and achievement of a Pakistani American?. The prefix Pakistani is there that clearly shows he is in naturalized American citizen. Does it take away any credit from America or for that matter any other country? As a matter of fact, there are tons of Pakistanis and Pakistani Americans doing a great job in America and elsewhere and we are proud of their contribution. A study led in part by Penn scientists examined the DNA of over 10,500 Pakistanis in order to guide research on treatments for heart disease. Many drugs developed to lower heart disease have targeted a gene linked to arterial plaque, Science Magazine explained. But this study found that the absence of this gene may not greatly affect one's risk for heart disease. Instead, the study found that the absence of a different gene — called APOC3 — might help. Penn professor Danish Saleheen and other researchers searched Pakistan for individuals missing a functional copy of the gene. Many Pakistanis marry their first cousins, so parents more frequently pass on identical copies of a gene to their children — meaning that they're also more likely to pass on two nonfunctional copies. People with these deficient copies of a gene are known as genetic “knockouts,” Philly.com explained. Scientists can deliberately breed animals to produce knockouts, but they must survey large numbers of people to find them in humans. The researchers found a man, woman and their nine children in Pakistan who were all APOC3 knockouts. When they consumed a high-fat meal, study participants without functioning APOC3 genes did not experience elevated levels of plasma triglycerides, according to Penn Medicine. Higher levels of triglycerides are a biomarker of heart disease risk. The family seemed healthy otherwise, which could suggest that missing the function of the APOC3 gene could help treat heart disease without other, harmful effects, Science Magazine noted. Saleheen told Penn Medicine that these were the world’s first APOC3 knockouts found. He’s been working in Pakistan for over 10 years, amassing as many blood samples as possible, to identify different genetic knockouts — so far he’s found over 1,300 — in over 70,000 participants, a figure he hopes will eventually surpass 200,000 as the work continues. The study was led by Penn's Perelman School of Medicine, the Center For Non-Communicable Diseases in Pakistan, the Broad Institute of MIT and Harvard and the University of Cambridge. Co-senior author of the study Sekar Kathiresan told Science Magazine that he hopes this work will lead to a "Human Knockout Project," similar in caliber to the Human Genome Project, in order to aggregate data on knockouts.